Why would a chief disciple of a famous master of yoga, Paramhansa Yogananda, choose Mountain View – home of Google and a major global center of the technology industry – for the site of a spiritual community? Surely, spiritual communities belong out in the country – far away from the city’s constant restless buzz, nestled in the hills where rents are low, the air is pure, and the members can grow their own organic food and spend their time thinking of God. In Silicon Valley, the rents are outrageous (a small one-bedroom can run upwards of $1800 per month), and the pace is hectic to the point of toxic. The streets are jammed with Lexuses, Beemers, and Mercs – and while the air quality is all right, thanks to the constant northwest breezes, there isn’t much open space for growing food. What possible influence can a small community of well-intended spiritual aspirants have, in an environment that’s super-saturated with the quest for wealth, power, prestige, and the latest-greatest i‑Thingy? Plonked own at Ground Zero of the American dream, can the Ananda Community have a transforming impact? In fact, virtually every second or third member of the Ananda Sangha congregation is employed in the tech industry. 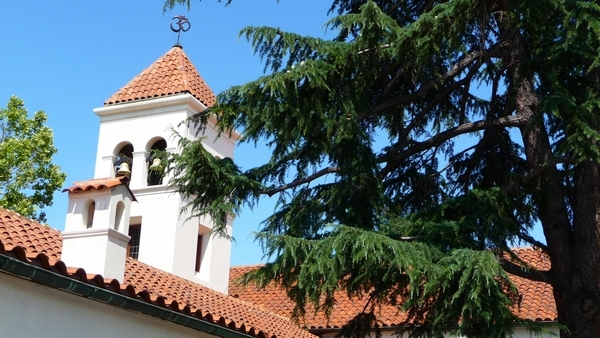 Swami Kriyananda captured the deeper reason for the creation of the community and its associated church, Ananda Sangha in Palo Alto. It was nothing less than a desire to offer a more rational, human approach to the spiritual life – and to life generally. Yogananda came to America in 1920 with a special mission to show people how they could make their religion practical, experiential, and free of rigid dogmas and the absurd demand for blind belief. In the mid-1980s, twenty-five members of Ananda Village, the original Ananda community in the foothills near Nevada City, moved into a rented mansion in the Pacific Heights neighborhood of San Francisco, with beautiful views of the Bay. For two years, the San Francisco ashram thrived. And then, when Ananda acquired East West Bookshop in Menlo Park, the San Francisco ashram closed and the residents moved to a large summer house in Atherton. The ashram was home to seventeen residents until the owner decided to rebuild, whereupon they rented a house in Los Altos Hills. In 1989, the growing band of Yogananda devotees purchased a 72-unit apartment complex on five acres at the northern edge of Mountain View, on the border with Palo Alto. For several years, the new Ananda Community was entirely inhabited by Ananda members. Today, about a fifth of the apartments are occupied by people sympathetic to Ananda’s way of life, but not formally affiliated. The members of Ananda Sangha’s heavily tech-oriented congregation have embraced a scientific approach to the spiritual life. The teachings of Paramhansa Yogananda include techniques for personal inner communion with God. “Don’t think that we’re here to offer the world a good community. When you offer someone a body without a heart, you’re offering him a corpse. “We’re offering people a living teaching. And that teaching begins with Kriya Yoga, and with inner communion and inspiration. And the more we can feel that inner reality and express it outwardly to others, the more we will have the ability to positively affect this world. “Now, Silicon Valley is a particularly interesting place for this experiment. There is a war today between the forces of darkness and the forces of light, between the forces of God that are trying to bring a new ray of energy and light into the world, and a consciousness that wants to keep things working the old way. “I was in Assisi recently, and I talked with a store owner. I said, ‘Is the Internet hurting your business?’ He said, ‘Yes, it’s hurting.’ But then we agreed that it’s so much more interesting to be served by friends. You go into a shop, and you know the owner can’t offer you the low prices you’d find on the Internet, but he’s a friend. You have a human contact, you’ve got somebody who has his problems, and you’re helping him with his life. “These attitudes are cancers on society. This is what communities like Ananda are for, to help bring back human relations and human values in our life. It’s a value that Americans tend generally to push aside, but all the same, America is a very spiritual culture beneath its present materialistic focus. “We have to be practical, but nonetheless, without God we’re missing an essential ingredient. The beautiful thing about having a community in Silicon Valley is that we’re helping reaffirm Spirit, right at the heart of where so much energy is going out to dehumanize the world. “Communities can help people keep their feet on the ground, help them keep sanity in their hearts, and help them understand what life is really about. “I’ve always enjoyed the story of Diogenes and King Alexander. Diogenes lived in a tub. It’s a little hard to imagine somebody living in a tub, but there he was, according to tradition. “King Alexander heard about this wise man, and he wanted to come and talk to him. Because he was happy that in his kingdom there was one man who was reputed to be wise. So he asked Diogenes if there was anything that he, as the king, could do for him. “If I’ve been able to accomplish anything in my life, it is because I’ve held that thought. I wanted to be a hermit, but God wouldn’t let me. I didn’t want to start a community, but I found that things weren’t working until I got involved.